The Liberty Flames threatened to tie the contest in the ninth, putting runners at first and third with one out. However, Ohio State reliever Yianni Pavlopoulos was able to retire the next two Flames batters to close out a 5-4 victory, Sunday afternoon at Pelicans Ballpark in the Baseball at the Beach Tournament. Ohio State lead 3-0 after one inning of play, only to see the Flames comeback to tie the game at 3-3 in the seventh and take the lead in the eighth. But, a two-run home run with two outs in the bottom of the eighth pushed the Buckeyes past the Flames. Left fielder D.J. Artis and shortstop Dalton Britt each collected two hits and a RBI for Liberty. The defeat snaps a four-game Liberty winning streak. The Flames drop to 5-3 on the year. The Buckeyes move to 5-1-1. Liberty finishes its four games at Baseball at the Beach with a 3-1 mark. Ohio State, the home team on the scoreboard, jumped out to a 3-0 advantage in the bottom of the game’s opening inning. Center fielder Daulton Mosbarger opened the Buckeyes’ first at bat with single and scored on a one-out triple by left fielder Ronnie Dawson. Third baseman Nick Sergakis and catcher Jalen Washington followed with back-to-back RBI doubles for a 3-0 edge. Liberty got on the scoreboard in the top of the fourth. Third baseman Dylan Allen was hit by a pitch and moved to second on a single through the left side of the infield by right fielder Will Shepherd. Two batters later, Britt lined a two-out single back through the middle of the diamond, scoring Allen, making 3-1 Ohio State. The Flames continued to cut into the Buckeyes’ advantage in the fifth. Designated hitter Eric Grabowski walked to lead off the inning and advanced to second on a sacrifice bunt by center fielder Aaron Stroosma. Catcher Josh Latta then walked, putting Liberty runners at first and second with one out. Two batters later, Allen ripped a two-out single back through the middle of the diamond, plating Grabowski and trimming the Ohio State edge to 3-2. Liberty tied the contest in the top of the seventh. With one out, Latta reached on an error by Ohio State pitcher Austin Woodby. Artis followed with double into the right-center field gap, scoring Latta to knot the score at 3-3. The Flames took a lead in the top of the eighth. First baseman Andrew Yacyk walked and advance to third base on a single by shortstop Dalton Britt to lead off the inning. Second baseman Andrew Kowalo followed by lifting a fly ball into left-center field, which Ohio State center fielder Mosbarger made a diving catch on. Yacyk then tagged and scored on the play. Initially, he was called out for leaving too soon. However, after an umpires’ meeting, the run counted giving the Flames a 4-3 edge. In the bottom of the inning, the Buckeyes struck with two outs. Mosbarger singled with two away and scored on a home run to left field by right fielder Jacob Bosiokovic. The right fielder’s four home run of the year gave Ohio State what proved to be the final score of 5-4. Liberty reliever Evan Mitchell held the Buckeyes in check for 5 1/3 scoreless innings after taking over for starting pitcher Michael Stafford, allowing the Flames to erase Ohio State’s early 3-0 deficit. The right-hander scattered four hits, striking out one and walking two. Eric Grabowski drops to 0-1 on the year. He gave up two runs on two hits. He struck out two batters. Ohio State’s Woodby moves to 1-0. The third of four Buckeyes to pitch in the contest, he allowed one run on one hit over 1 1/3 innings. He walked one batter. Pavlopoulos pitched the ninth to record his second save of the year. Ohio State had 11 hits, while Liberty collected eight. The Flames made two errors. 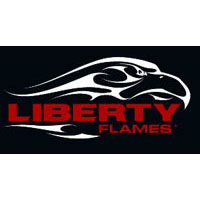 Liberty next travels to Norfolk, Va., for a contest at Old Dominion. First pitch at Bud Metheny Stadium is scheduled for3 p.m.